Parts of Speech Review and a Little Fun! | I Teach. What's Your Superpower? Parts of Speech Review and a Little Fun! Hey, hey! Happy Halloween! I hope everyone is ready for the sugar induced coma coming your way tomorrow. My husband is escorting the 2nd grader around the neighborhood. The 5th grader ditched us for a block party with a friend in a different neighborhood. It's our first Halloween without the two of them trick-or-treating together. My heart's a little sad about all this growing up business. But-Check out the eye candy that's hanging in my hallway right now. 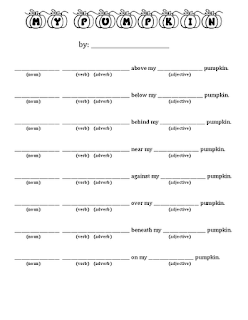 We have worked our behinds off the first grading period covering nouns, verbs, adjectives, adverbs, and prepositions. I've been using a sorta kinda version of mentor sentences. And let me tell you, my kids can REVISE. No joke, they've got it. Funny what happens when you move beyond identifying parts of speech into how to use it to improve writing. I pretty much copycatted her lesson because it was so perfect. Day 1: I gave them a copy of a simple pumpkin. 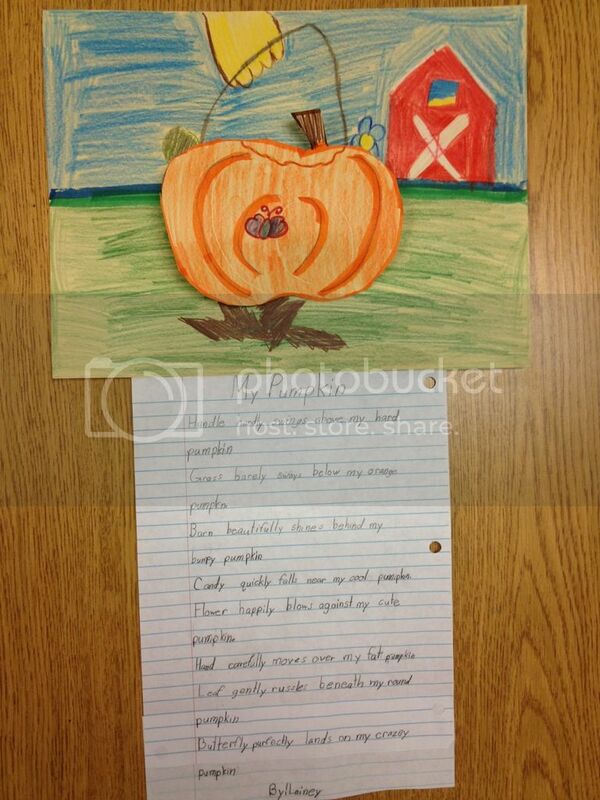 Then we hit the prepositions and nouns-I told them to draw something on their pumpkin, below it, behind it, above, etc. 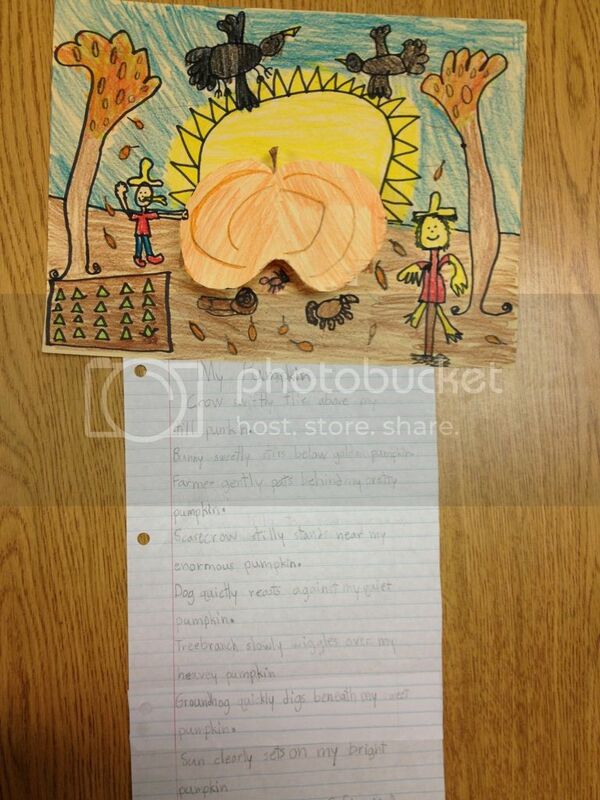 Day 2: We used our pumpkin picture as inspiration for our pumpkin poem. I modeled for the kids. We filled in our noun, added in what our noun was doing (verb), then how it was doing it (adverb). 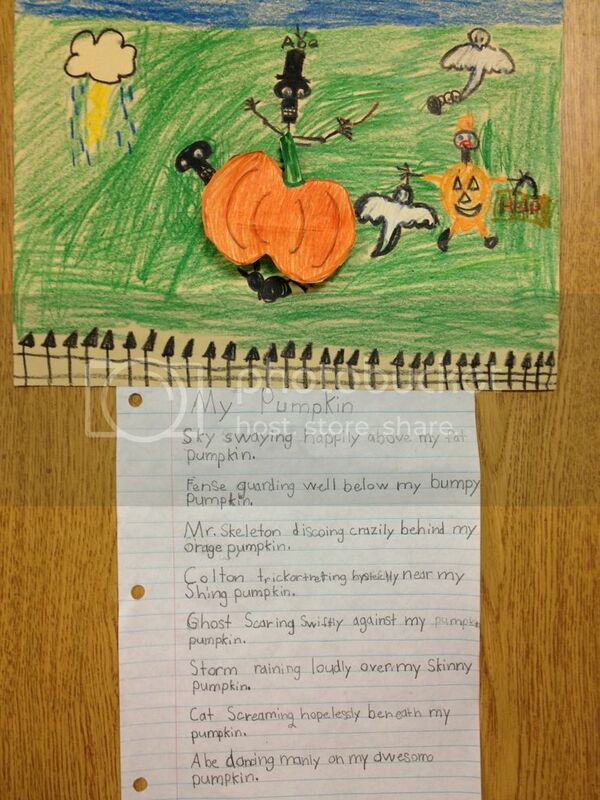 After that we added in adjectives to describe our pumpkin. We drew, colored, and cut out our pumpkins to be ready for the next day. Day 3: Final copy of poem and background time. We added the pumpkin to the background with a little card stock/accordion fold action. Oh, wow, these papers are beautiful! Beautiful pics & beautiful writings!